Astronomy Magazine or Astronomy.com came out today 10/20/2016 with a really good article about Pluto, however, near the end Alan Stern still makes a reference to Wright Mons and Piccard Mons as cryovolcanoes. NASA continues to support this claim even though there is (in my opinion) overwhelming evidence to the contrary. On this page I'm going to place NASA's false assertion into the proverbial coffin and nail it shut. The more something is repeated the more it's accepted as true. Moving on to the naked Emperor. "The Emperor's New Clothes"is a short tale by Hans Christian Andersen about two weavers who promise an emperor a new suit of clothes that they say is invisible to those who are unfit for their positions, stupid, or incompetent. When the Emperor parades before his subjects (naked) in his new clothes, no one dares to say that they don't see any suit of clothes on him for fear that they will be seen as "unfit for their positions, stupid, or incompetent". Finally, a child cries out, "But he isn't wearing anything at all!" There are two areas that NASA suggested might be cryovolcanoes which they named Wright Mons and Piccard Mons. There is another hole like area below Piccard Mons that is clearly not a volcano or Mons so it didn't merit a name. I gave this hole the name "Not Mons" as it clearly is not a volcano just as Piccard and Wright are not Mons. I will clearly show this to be the case. Not Mons - Named by me to acknowledge and honor the Truth. First I need to show you a really close up view of the section labeled "1". Then we'll look at 2 and 3. Above image Section 1 - Close up. Take note of how the red tholin covered land ice is deeply pitted along with shallow goose bumps on the surface which are acquiring clumps of gray fluid. Nearest to the SP fluid, the land ice is engulfed completely by gray fluid the further away from SP the gray fluid creates small globs which become more sparse the further you travel from the source of the fluid. Also take notice of how deep the deep pits are. According to NASA, they are nearly two miles deep and these are clearly not cryovolcanoes. These are merely 2 mile deep pits. Here's what NASA reports regarding the size of these deep pits. These pits are nearly 2 miles deep (important point here). Traveling a little bit more south but in the same area. This area just east of Wright Mons looks nearly identical to the above images on the southeastern shore of SP. Take note of all the cavities with red tholin on the walls. In the above images there are large deep pits filling with gray fluid, here there are also large pits with gray fluid accumulating on the roughened goose bump surface. It looks very much like land ice that is pitted with shallow goose bumps as well as deep pits covered in gray atmospherically introduced thick viscous material. Same image no annotations, look at the red tholin everywhere lying under the gray material. The tholin covered land ice is heavily and deeply pitted while the atmospherically deposited gray material rest on top like a veneer. Below are the two pseudo cryovolcanoes called Wright Mons and Piccard Mons which are either large holes in the land ice or blocks of broken land ice that are being mashed into the softened land. Did you notice how your brow furrowed while you strained to read this light gray text, I'm using the technique noted in the video above to make you distrust the NASA quote because I know it to be wrong. Wright Mons is nothing more than a giant block of rock hard land ice being pushed into a berm of muddy land ice. The dimension of this Wright Mons mound is measured by NASA from its outer edges not the hole in the middle but the height and opening is pretty close to the same size as the deep pits on the eastern side of SP. Below the yellow outline shows a series of 2 mile high ice bergs mashing into a muddy land. These icebergs along the south right edge are being folded into the mud. If you trace the yellow extended finger to the left I outlined this area in red which is an extension of what you see outlined in yellow. It's a series of 2 mile high ice blocks pushing the muddy land up 2 miles high creating a massive 2 mile deep hole into which the mud has not yet flowed. Here's a wider view of the scene. Compare the size of the deep holes on the right with the deep holes called volcanoes on the left. Also take note of how the large two mile high blocks of icebergs or land ice are clustering as a group and plowing into the softened mud like gray land that is being squished and pushed and mounded up looking like a bulldozer plowing into a muddy berm. Wright Mons is about 2 miles high as it is resisting the plowing influence of the 2 mile high icebergs that are pressing into the softened land ice. Contrast and brightness increased by 60 percent. On pages 11 and 28 I explain in more detail how Wright Mons is an eddy of muddy land being pushed up and around a trapped ice block by Norgay Montes. In the below image you can see more of this same area where there are holes doting the surface. The holes along the western side of SP appear similar to the ones on the eastern side where you can see down to the bottom of the 2 mile deep floor of these massive pits. They are not cryovolcanoes. Click to download a large version of the below image. A closeup of the fractured and fragmented land ice with holes and sharp angled deep pits. These are not volcanoes. I named my own NON-Cryovolcano and called it "Not Mons" as it is clearly NOT a cryovolcano yet it is part of the same series of holes that make up the fold patterns or deep land ice pits of the NASA named pseudo volcanoes. Next I want to show you a couple images of real volcanoes take note of the erosion patterns and how they show lines of erosion emanating from the top down towards the base in relatively straight lines and compare that to what you see at Wright Mons which is circular rings with NO downward erosion patterns. Even in a relatively young and active volcano we see these vertical erosion patterns. Does wright Mons below look like any of the volcanoes above? Wright Mons has some circular folds but most of the folds align in a NW to SE diagonal pattern as if being pressed against and folded by the massive iceberg mountains called Norgay Montes. Below are some shield volcanoes on earth take note of how all these shield volcanoes show vertical striations running from the mouth of the volcano down to it's base. We don't see these features at Wright Mons. Below is Olympus Mons on Mars while there are circular mounds they tend to not align in one direction rather they are completely circular and there are the tell tale signs of vertical striations running down from the mouth. I added some lines to the diagonal pattern created by the icebergs as they mush into the muddy land ice. These fold lines show how the muddy land is being compressed. Once again take a look at Wright Mons the folds align diagonally with the crushing icebergs called Norgay Montes and there are no vertical striations running down the outside from the mouth. This is a scene where a softened muddy surface is being compressed up into a mound. Another significant point here is that this area is completely free of impact craters meaning it is young soft muddy material. When an impact occurs in this location it gets swallowed. This land ice is muddy while the 2 mile high cluster of icebergs (Norgay Montes) pressing into the land ice are rock hard. NW to SE Diagonal compression folds no vertical striations obvious signs of icebergs being folded into the mud and no impacts mean this is a berm of mud being created by Norgay Montes icebergs getting folded into the terrain. This should finally seal the coffin on this issue. 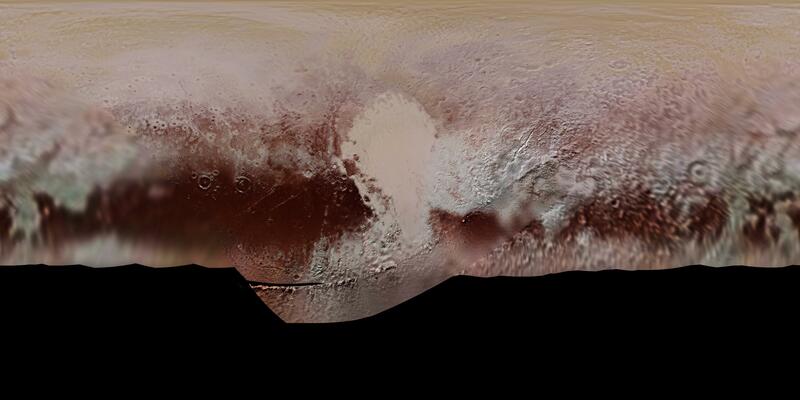 In case you are not completely convinced, allow me to show you some real Pluto cryovolcanoes. Here's the center of Pluto's Spider where subsurface pressures are creating expansion fractures as well as a central mound of material coming out of a hole A.K.A. a volcano. Compare this cryovolcano at the center of the spider with the volcano called Mount St. Helens on Earth. Western edge of Sputnik Planitia with a string of volcanoes similar to Laki Iceland. Click the image to see it up close. Cryovolcanoes with gray magma like fluid flowing into tributaries, rivers and lakes. I really want to believe NASA scientists want to present the truth about Pluto/Charon but obvious errors like this really make me wonder about their abilities to interpret the terrain and motives for doing so. that which hundreds of dedicated, paid, smart scientists at NASA can't see? There are a couple reasons why this misrepresentation of Wright and Piccard Mons bothers me. It's been nearly a year and a half since the New Horizons flyby of Pluto and NASA has not adjusted their interpretation of these false volcanoes. I find it difficult to believe it's an oversight because of the below images of Serenity Chasma on Charon. These images were released two days ago (10/18/2016) by NASA and I am impressed by them and the fact that I didn't see this myself. Pretty cool stuff. Someone at NASA is still evaluating the topography of Pluto/Charon by careful scrutiny and observation else they would not have picked up on the subtle details in this image which show these land slides. If NASA is still looking close enough at Charon to find this kind of detail, why are they still calling Wright and Piccard Mons cryovolcanoes? Seeing these images has made me realize, I've become complacent. So I went back and started looking closely at Charon to see if I could find anything I'd missed and there is one interesting feature. There is melt water along the rim of an impact which demonstrates how impact energy heats and softens the ices. The Emperor has no cloths! I see it and I'm saying it. Its time for NASA to acknowledge it. Wright and Piccard Mons are not cryovolcanoes. I have additional information about Wright and Piccard Mons on these pages.